The NETGEAR® 10 Gigabit M7100 series consists of a fully managed, low-latency, line-rate 10G Copper "Base-T" switch solution; 24 ports 10GBase-T (RJ45) that support Fast Ethernet, Gigabit Ethernet and 10 Gigabit speeds for server, storage and network progressive upgrade; 4 ports SFP+ that broaden 10 Gigabit connectivity for 1G/10G fiber uplinks and other DAC connections. * Maximum wireless signal rate derived from IEEE Standard 802.11 specifications. Actual data throughput will vary. Network conditions and environmental factors, including volume of network traffic, building materials and construction, and network overhead lower actual data throughput rate. The 10 Gigabit Aggregation M7100 series switches are NETGEAR affordable fully managed switches for 1G/10G server access layer in campus and enterprise networks, and for high-density, high-performance 10GbE backbone architectures. The M7100 series delivers pure line-rate performance for top-of-rack virtualization or convergence, without having to pay the exorbitant acquisition and maintenance costs associated by other networking vendors. NETGEAR 10 Gigabit Aggregation solutions combine latest advances in hardware and software engineering for higher availability, lower latency and stronger security, at a high-value price point. Like all NETGEAR products, the M7100 series delivers more functionality with less difficulty: Auto-iSCSI optimization, Private VLANs and Local Proxy ARP take the complexity out of delivering network services for virtualized servers and 10 Gigabit infrastructures. Mid-sized organizations are optimizing their data centers and server rooms by consolidating servers to free up space, power, and management overhead. The first step usually involves consolidating applications onto fewer servers than the old single-application-per- server paradigm. Often, the next step is server virtualization. Server virtualization supports several applications and operating systems on a single sever by defining multiple virtual machines (VMs) on the server. Each virtual machine operates like a stand- alone, physical machine, yet shares the physical server processing power, ensuring no processing power is wasted. IT departments can reduce server inventory, better utilize servers, and manage resources more efficiently. Server virtualization relies heavily on networking and storage. Virtual machines grow and require larger amounts of storage than one physical server can provide. Network attached storage (NAS) or storage area networks (SANs) provide additional, dedicated storage for virtual machines. Connectivity between servers and storage must be fast to avoid bottlenecks. 10GbE provides the fastest interconnectivity for virtualized environments. There are three types of storage in a network: Direct-attached storage (DAS), NAS, and SAN. Each has its advantages, but SAN is emerging as the most flexible and scalable solution for data centers and high-density computing applications. The main drawback to SAN has been the expense and specially trained staff necessary for installing and maintaining the Fibre Channel (FC) interconnect fabric. Nonetheless, SANs with Fibre Channel have become well established in large enterprises. Until recently, network design best practices recommended equipping the edge with Fast Ethernet (100Base-T), and using Gigabit uplinks to either the core (for two-tiered network architectures) or aggregation layer (for three-tiered networks). Today, traffic at the edge of the network has increased dramatically. Bandwidth- intensive applications have multiplied, and Gigabit Ethernet to the desktop has become more popular as its price has decreased. Broader adoption of Gigabit Ethernet to the desktop has increased the oversubscription ratios of the rest of the network. The result: a bottleneck between large amounts of Gigabit traffic at the edge of the network, and the aggregation layer or core. 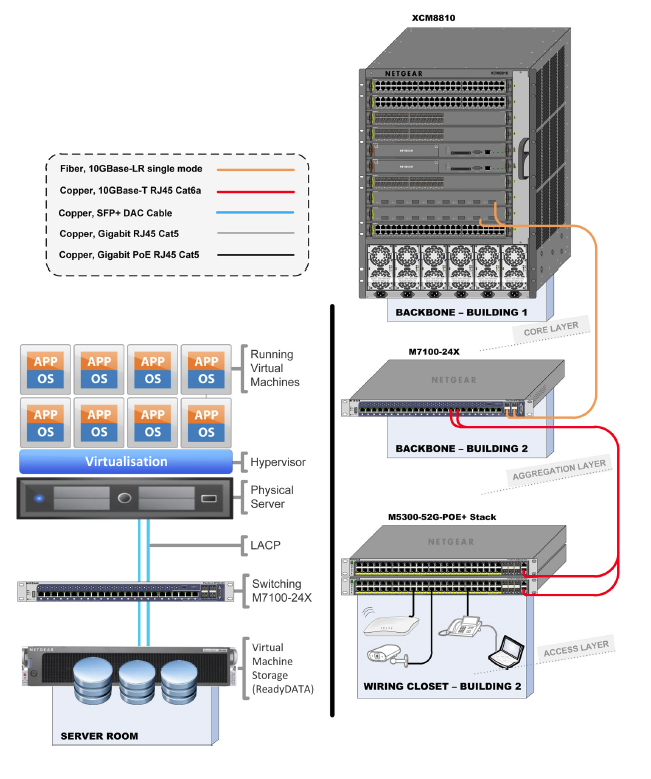 Download the NETGEAR M7100 Datasheet (.PDF).